It was a humid afternoon when we sat at the viewing gallery with other foreign visitors, patiently counting down to feeding time. About 5 meters from in front of where we sat, was a large wooden platform where the Orangutans would soon dine on. There was only a thin fence separating us. Soon, the park rangers would enter the fenced compound with a huge bundle on their back. They unloaded bunches of bananas on the platform and poured fresh milk into open plastic buckets. Once the table is ready, the rangers would let out a loud call into the forest. It was lunch time. Almost simultaneously, a few apes started to emerge from thick treetops. Some of them were already seated on tree top nearby waiting before the rangers entered. Pretty impressive without a clock. Then carefully, they would maneuver and from tree to tree by grabbing onto the branches, swinging using their strong forearms. 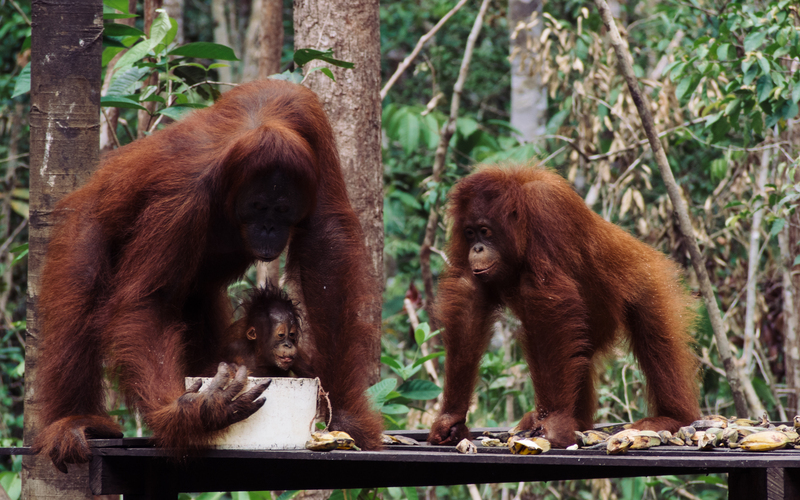 When they arrived at the tree right above the platform, they would scout the area below to ensure no alpha male orangutans or other present threats. Social hierarchy is very much respected asthe oldest alpha male is always the first to dine. Once the coast is clear, very cautiously, the apes would then descend and make their way to the buffet table. 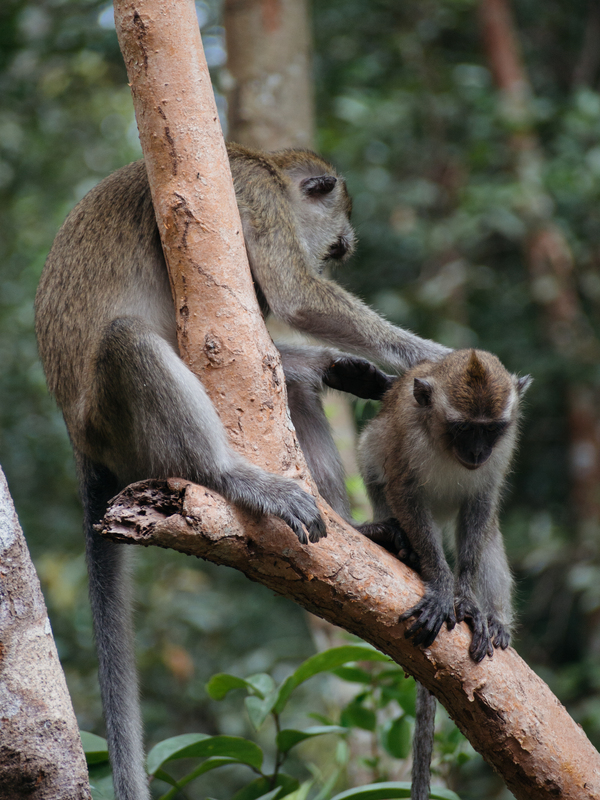 Some of young ones – yet to develop the strength to climb trees – would cling onto their mothers as they make their way down. It was like a potluck party. 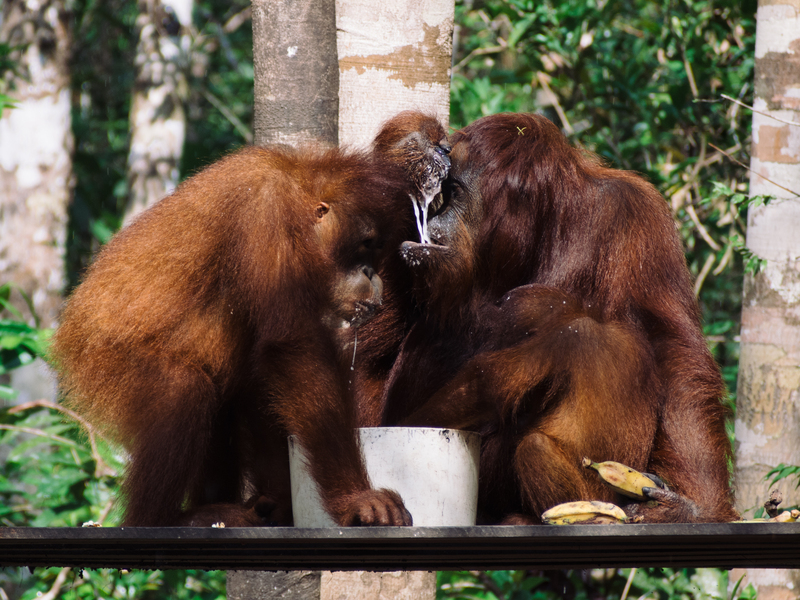 There’s something fascinating about seeing the orangutans interact with each other. It is said that orangutans share 97% of DNA sequence with human beings. 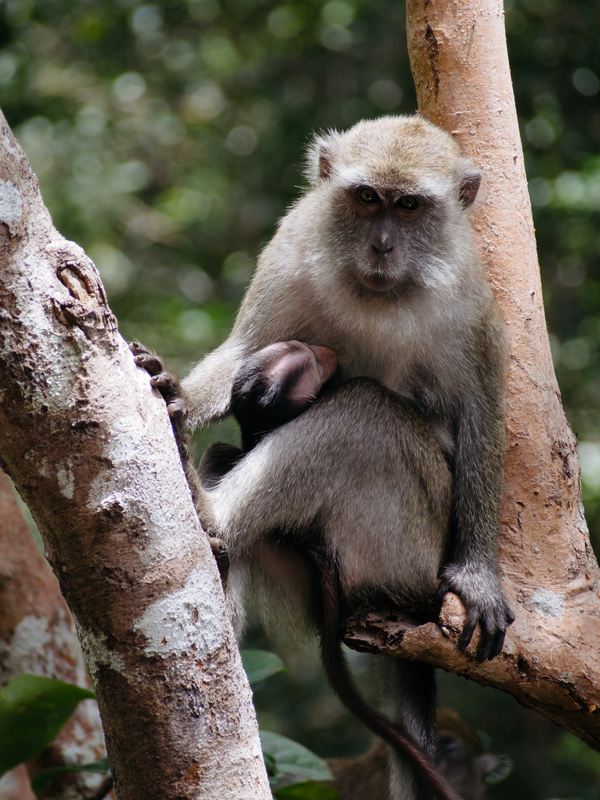 Both species could trace their lineage to the common ancestor millions of years ago. Perhaps that’s why their expressions could be described as human-like. A younger ape was waiting for its turn to the bucket of milk that was occupied by an older ape. It was constantly peering into the bucket with a worrisome expression that advertises its thoughts. It’s probably no different from us peering at the dessert table to check if the awesome macarons have all been swiped by your auntie. Almost every action seemed to have a human equivalent. We had 3 separate viewings of the feeding, but we never got bored of them. 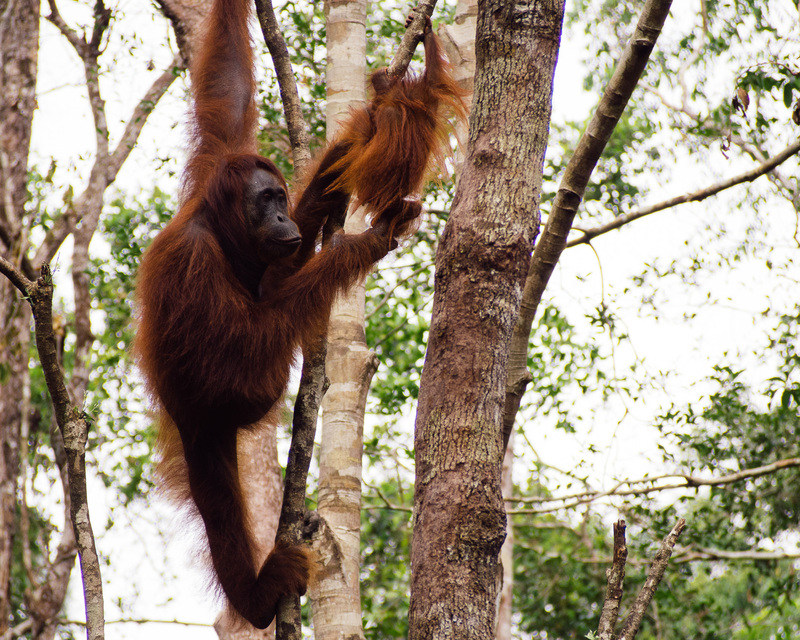 The incredible experience above took place at Tanjung Puting National Park in Central Kalimantan, Indonesia. Due to its obscurity, it isn’t the popular destination it deserves to be. As it’s only served by a handful of local airlines, the only reason you would fly here is to visit the national park. To get into the heart of the national park, we had to go sail through Senai River. There isn’t any land option as far as I know. The tour we signed up for had us staying 3 nights on a local traditional slowboat called klotok. Our klotok had 2 stories – the crew and captain’s cabin at the bottom, and the passengers’ on top. The passengers area had a covered top but the sides are completely open. It only had a fold-able dining table, plastic lazy chairs and a couple of mattresses on an otherwise spacious cabin. There is clean water for showers but it’s limited. Generators are onboard for electricity, but it’s only run for a couple of hours a day when the klotok is docked. Basically, it’s back to nature. Most of our 3 days were spent onboard sailing along the river. Throughout the journey, we were surrounded by lush greens. Quiet and peaceful. It was especially poignant for us Malaysian/Indonesian to experience the Bornean rainforest after reading about it in schools. We also enjoyed the experience of being disconnected as cell reception was non-existent. With the guide’s help to spot animals, there’s always something interesting going on anyway. 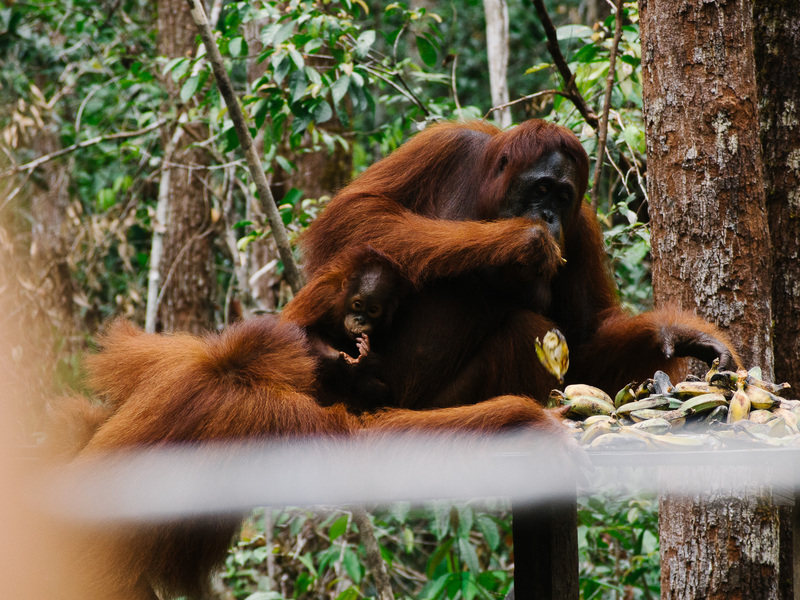 The apes are not the only reason to visit the park as it’s filled with various flora and fauna indigenous to Borneo. 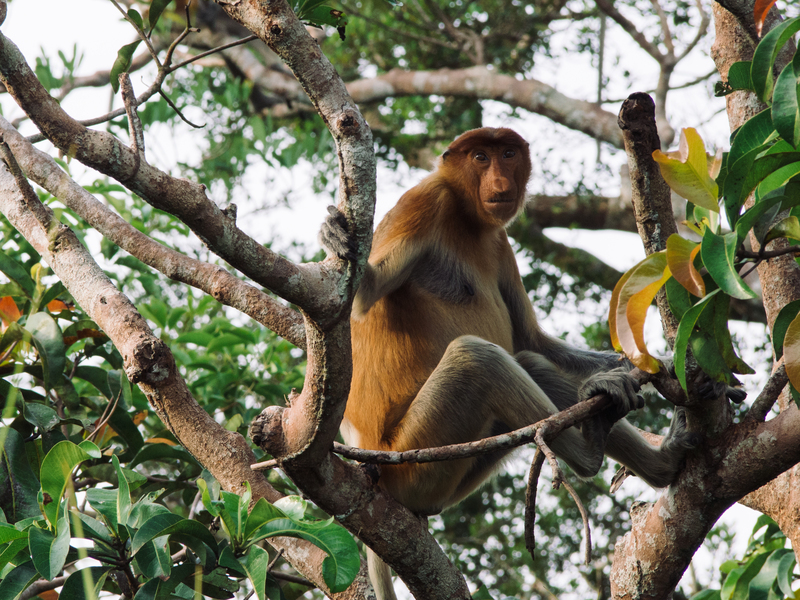 The oddly-shape-nose proboscis monkey could be found loitering on trees every evening. 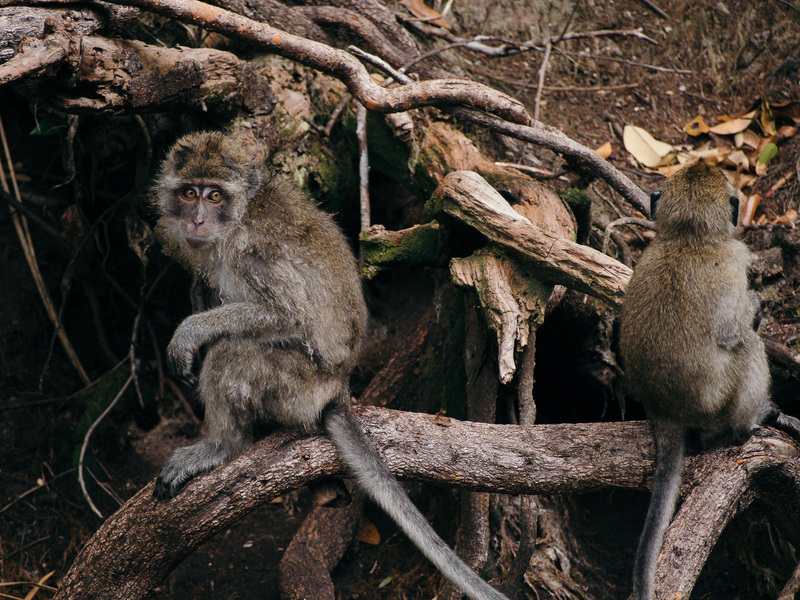 The locals named them ‘monyet belanda’, or Dutch monkeys, due to the locals’ disdain for their colonial masters. On one of evenings, one of the guides showed us a baby crocodile that he found laying about. It was slightly bigger than an adult’s palm and was generally harmless. It was the closest we have ever gotten to a crocodile and we managed to touch it. The guide would then release it the next day. Hopefully it would be able to fend for itself and grow to be the fearsome killer predator. On the tamer end of spectrum, there were various points of the river where fireflies roam at night. Once the sun has set, stretches after stretches of trees would be lighted up by the minuscule bugs, blinking like Christmas lights. There were no other boats in the vicinity with the only light came from the moon. It was truly an unforgettable spectacle. We were lucky that on another night, a couple of flies sneaked into our boat and lingered outside the mosquito netting. Imagine, on a traditional boat in the middle of a Bornean rainforest, in an otherwise pitch black darkness, we had our own mini light show as we dozed off into the night to the tunes of crickets and co. The best way to enjoy Tanjung Puting National Park is to hire a klotok (A traditional river boat), a guide, chef and captain for a overnight tour (I recommend at least 3d2n). It might be possible to arrange them separately on the ground, but going with a tour saves you a lot of hassle. A better way is to go through a local travel agent. We contacted Varada Borneo Tour and the organizer, Wati was very responsive in replying to my emails. Although we paid a heft price for the entire trip, we felt that the quality of the tour and the abundance of sights were worth it. Moreover the guide and crew were exceptionally professional and took care of us very well. The food served by the chef was of so high standards that they rival the best local restaurants. 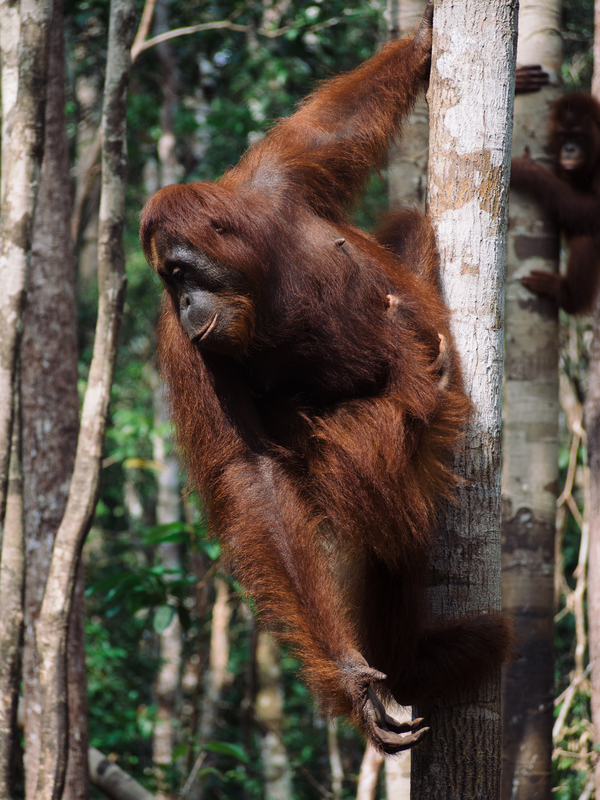 To get to Tanjung Puting National Park, you’ll need to base in Pangkalanbuun, Central Kalimantan. It’s possible to fly from Jakarta to Pangkalanbuun, several domestic airlines serve this route. However, punctuality and quality of smaller airlines remain suspect. We were due to fly from Pangkalanbuun to Pontianak after our tour. However, we were only told at the airport that the route has been dropped for 2 months and were given an immediate refund. We were stuck in Pangkalanbuun for a day and had to fly back to Jakarta instead. Therefore when it comes to local Indonesia flights, always double check the status before you fly. Also, remember to bring mosquito repellent. We suffered numerous bites at the swampy Tanjung Harapan that although harmless, lasted a couple of weeks.